Really fun chart about the economics of a college education. (via @ryansager). The full chart is here. Here are some excerpts. Your last except is interesting. I though English majors were supposed to go to law school, but I suppose I only knew the ones who studied quite a bit. Most of the Poli Sci majors I’ve known have gone to law school or taken-up with some government agency or another. If I were an English major, I’d have written “thought” instead of “though”. We’ve been reading vintage doonesbury, and wasn’t this one of Gingrich’s points, during whatever conservative revolution that was — that we shouldn’t support students to go to college and party? I feel idea recycling. I remember (in the 80s) reading some books of old Doonesbury strips (BJ was in Vietnam). He was pretty good. But these kids today have all sorts of problems. 10 hours a week partying and 8 hour studying are both low, especially if the 10 hours includes looking for somebody two is 21. 1. High drop-out rates. The value of a college degree is only worth debating if you actually have a college degree. With drop-out rates around 50%, it seems like there are about twice as many people striving for college than there “should be.” Improving the graduation rate would just make college more like grad schools, increasing the number of grads in jobs that don’t require their degrees. 2. Small value of private colleges. The graphic overstates the difference (comparing Yale versus UConn). A similar study comparing Penn to Penn State found that Penn’s Ivy League pay premium disappeared when you compared Penn grads to Penn State grads who were admitted to Penn but chose not to go. Yale grads make more money because they are “the kind of kids who would get into Yale,” not because Yale made them that much more marketable. 3. College majors follow supply and demand too. English, Communications, and Social Work majors tend to have the lowest post-grad incomes because there are lots of them. ($29-35K) Math/ Engineering majors make a lot more. Those differences continue over the course of a career. I know a fairly significant number of people who started college, dropped-out (or flunked out), and then came back to finish and did very well. I guess I’m not very worried about the drop-outs. Also, don’t most states have some public college that has to take everybody who graduates in that state? My undergrad institution was required to do so and I don’t think it hurt many people. Who made the chart? I can’t tell. BD — I’ve never been in Vietnam, and certainly not during the war. :-). I mostly agree about the Ivy value, because good state universities have opportunities for their best students, if the student is driven and sophisticated enough to find them (and a student who gets into an Ivy is likely to be such a student — unless they’re a legacy-type applicant). And, I think for undergraduate, going with the money might make sense. But, you have to watch out to make that the money actually does make sense (it seems to, for undergrad, if you are paying your way). But, with new aid policies — Harvard, for example, can be a good deal (free if your family makes less than 60K), and, apparently 10% of income or less for families making up to 180K. Harvard is special, of course, but you have to look at what the deal is. And, I think different logic applies to grad education. For example, high level legal jobs still look at where you got your degree. And, the cost differential between private & good public for professional degrees is getting smaller and smaller. I was shocked to look at Hastings (Berkeley)’s tuition. It simply doesn’t save you any money to go to Berkeley (or even Davis) instead of Harvard (or Columbia). I used to. But, it doesn’t anymore. Graduation rates fluctuate widely based on the competitiveness of the school. “Non-competitive” colleges like yours had, on average, a 34.7 graduation rate after 6 years. Much worse than half. This percentage increases fairly linearly through the 6 levels of competitiveness from “less competitive” (39.6%) to “highly competitive” (87.8%), although there’s lots of variation in each group. Certainly some students return after dropping out, and eventually eke out a degree after more than six years, but then the question is whether they would have been better off working a few years and waiting until they were ready before they started. They are giving up real income now (and paying real college tuition now) for a chance an a graduation premium that won’t arrive for a very long time. I was shocked to look at Hastings (Berkeley)’s tuition. Small point- Hastings and Berkeley are distinct- Hastings is a stand-alone law school (semi) attached to the UC system, in San Francisco. It gets much less of its funding from the state, and in a different way, than do the other UC Schools. Because of this, it has the highest (as high as most private schools) tuition, though the tuition at most of the UC law schools have now effectively been “privatized” too, as have Michigan, Virgina, etc. You’re right that for law, pedigree is extremely important as to what type of job one can get. My impression is that this is so, to a lesser degree, w/ MBA programs, too, and of course with academic programs as well, though less so than law, perhaps. Ragtime, I looked-up my old school (UN-Lincoln) as “non-competitive” seemed a bit insulting for an R1 school. And the graduation rate was always close to 50% and is now well above that. Anyway, they now require you to graduate in the top of your high school class or hit 20 on the ACT. Basically, they had to keep nearly open admissions for political reasons that have lessened because there are now more schools in the NU system (they promoted a state college). “Non-competitive” was intended (by myself and the report) as a description of admissions standards, not a value judgment on the value of the school. Many family and older friends went to the “non-competitive” CUNY schools and received a top-rate educations. Sorry for any unintended insult. I wasn’t really upset. I just thought our graduate rate was much better than 35% and went googling. Sorry, yes, I should have said Boalt. The point I was trying to make was that the UC system’s law schools (and Michigan, and even some others that are not so highly ranked, like Ohio State) cost enough that they are no longer good deals. In the old days (20 years ago), the differential was much bigger, and people did indeed choose Berkeley, with the plan that they’d probably practice in CA, where the prestige value was quite high enough. Many of the flagship state colleges do indeed practice “selective” admissions. That’s another change from the past, though perhaps not so much, because the selection was done earlier, by self-limiting non-college bound students. I think this is another issue we’ve discussed peripherally — which is whether every student should be prepared for a college education, or whether demanding that just sets everyone up for failure. Many of the flagship state colleges do indeed practice “selective” admissions. In Nebraska, the flagship was the fleet in the sense that the other parts of the NU system were a two-year ag school and a commuter school (dormless) for Omaha. Expanding Omaha and adding University of Nebraska-Kearney (as much as it pains me not to call it Kearney State College), let them be a bit selective. A discussion of whether college is “worth it” has to include the consumption good aspects, no? Every day, I feel good about myself because, among other things, (i) my shirt, suit, scarf and coat work together and look good together, (ii) I live in New York City, the center of the world, (iii) I am a husband and father, and, (iv) relevantly, I have degrees from fancy schools. If I had the exact same income, but lacked that last desideratum, I would feel less good about myself. Now, I haven’t tried to figure out exactly how much that extra feeling of goodness is worth, but it’s not worth zero. The page’s URL includes, “onlinecollegesanduniversities.” This page calls itself an “infographic,” but I call it a slick bit of marketing. Most 18 – 20 year olds party. I’m not in favor of it, but I don’t think I’d prefer the model of living in your parents’ basement, while completing online courses. (Not that that would do much to decrease partying, as much as parents might like to think it would.) Alcohol use and abuse is not limited to college students, strangely enough. Shocking, I know. delay…”from debt” That should be, “due to debt,” perhaps? A “Tuition, Room and Board” comparison between public and private is difficult. For starters, many students enrolled at private colleges are not paying full tuition, and may have stipends to cover room and board. Secondly, I was shocked to hear from the parent of a graduating high school senior that our local state university had charges it dubbed, “tuition,” and “fees.” Tuition amounted to only some $4,000. Fees brought the total close to $20,00. Are “fees” included in that comparison? My comparison was for professional schools — undergraduate in-state tuition is still a deal. The difference seems to amount to 120K (if you pay your own way, which is more likely in public than private). So, I guess the question for y81 is whether the personal knowledge of the fancy degrees is worth 120K. I guess over a lifetime, that’s only $6/day, the price of a latte (assuming the money couldn’t have been invested at a higher than inflation rate of return). Now, I kind of value my private school fancy degrees, but mostly for the experiences, relationships, and, yes education, that came along with them. Good points, stranger! But did this website did use valid studies, right? I’ve seen that dropout rate before. It really is atrocious. Shows how poorly high schools are preparing kids for college and how tough the emotional and cultural transition can be for kids. I’m also predisposed to agree with any study that shows the benefits of a good public college education. That’s what I did and that’s where my kids will go (no college funds here). The sources are in very fine, gray print, in the lower right hand corner. It looks like an assembly of facts from a range of sources, from government studies, to web engines, to newspaper and magazine articles. “Lies, damn lies, and statistics.” It’s probably possible to go through the same studies, and online facts, and assemble a poster which would give an altogether more positive picture of late adolescent life in America. I wouldn’t assume that your children will end up at a public college, when they actually sit down to compare offers. It depends upon their academic records, and how much the colleges want them. A cousin’s child is currently waiting to hear from the rest of his colleges, but he already has an acceptance from a private college, which includes a generous scholarship. High school students haven’t seen anything of the world. If one out of three discover they don’t want an academic degree, after a year at college, that’s a good thing to discover before paying another year’s tuition. I’d much rather have a system which allows them to try, instead of a system which restricts access to university to those students guaranteed to do well. A certain number must drop out from economic pressure, or medical complications, as well. I think I’m reacting so strongly to this chart, because it implies that college students are drunk video-game players, without any academic interests. That just isn’t true for many students. I also do not believe that the road to heaven requires an engineering degree. Engineers, like my husband, are fine, good people. To become an engineer requires a unique skill set which many people don’t want to acquire. MH: Mmm, I guess you didn’t come here for the “nice shoes.” However, I recall that Keynes once that those who fancy themselves practical men of affairs usually march to the tune of some long defunct economist, and Miranda Priestley said something similar about those who fancy themselves immune to the call of fashion. In Lake Wobegon, all the children are above average. Here in the USA, though, half of the children are below average. Those are the ones who are getting hornswoggled into paying for fifteen years the college loans for the two years they lasted, with decreasing success, watching others do stuff which is wholly beyond them. There is an ideologically-based notion that all students can succeed if they apply themselves. It’s not true. “Never try to teach a pig to sing. You get dirty, and it annoys the pig”. It’s just not fair to a dull-normal kid to put him/her into a situation of guaranteed failure. Far better to learn to be a good phlebotomist. y81: Only for “fashion” definitions of “defunct”. I intend to go on dressing as if it were 1999 or so for as long as it is possible to do so. I figure it will work until at least 2020 and by that point, I may be too old to care. I also intend to only own one top coat because black goes with anything. If women didn’t really prefer having more closet space to being seen with a man whose clothes match, people like you would cause real trouble for the rest of us. Dave S, don’t you doubt the ability of high schools to sort-out the 1/2 (or whatever it is) who can benefit from further education. I mean, it is very hard to tell “dull” from “poorly taught”. Anyway, I think public colleges owe taxpayers a shot and most states still have an option that avoids crippling debt levels. Yeah, I’d listen to this when a parent sincerely understood this about their own child. I believe the idea in principle. Of course, it’s not true about *my* children. They’re clearly intellectual superstars (no, really, I have proof.). And, I have no trust whatsoever in a HS’s ability to sort children on this basis. I think we need to make sure that people can get educated without crippling debt, and encourage them to do so. I don’t think we should assume or create a world in which it is necessary for every child to do so, if it’s not right for them. PS: I’ll add that I think parents are pretty poor judges a lot of the time (in either direction). Bj is agreeing with me too frequently. Maybe I need to see what this Glenn Beck is about. There’s a lot to chew on, in the distinction between ‘dull’ and ‘poorly taught’, though I think it is mostly important for young children. By the time a kid has been through high school, real bootstrapping Horatio Alger stories are kind of rare. Malcolm X comes to mind. Reverend Ike? How dreadful does school have to be, to stunt? By the time a kid has been through high school, real bootstrapping Horatio Alger stories are kind of rare. My dad was barely able to avoid flunking out after his first year of college. He dropped out and after three years in the Navy, he did very well. I know a tenured professor at an Ivy who was told by his high school counselor that he really shouldn’t be considered college. In my generation, and a white guy, and not in a deeply urban unacceptable school, so all the usual reasons for a mistake don’t apply. I think he was just a flake who woke up to what he could do in college. I think there are always people who wake up to their intellectual ability and interest at different stages. I usually pinpoint my awakening to junior high school. I know others for whom it was earlier or later (high school, college, graduate school). I do not think these stories were rare, when they were possible. I also worry that they’re less possible now, that, for example, my awakening in junior high would have been too late in a world where achievement is programmed (in the elite intense child-raising world in which I exist) in elementary school. I know plenty of 25 to 30 year-old guys who decided “fat, drunk, and stupid is no way to go through life” and went to school as “stupid” was the least painful of the three to change. Yes, Dave, I really think you’re off-base here, and wonder if it has to do with the DC environment. I was fairly intense and directed child, as was my spouse, and are my children. But, I’ve seen other families where the children just seem somewhat unsure about what they want, and how to get there, and some of these children definitely find goals, direction, skills, and motivation a bit later. In a competitive environment, their parents often see the lost time, that could have been spent working towards the goal, and for some kids, this lost time might produce differences in their overall success measured in absolute terms. But, there are benefits to their circuitous roots, not the least of which is that they know that it’s a chosen goal and not one that was based on a random interest and ability of, say, a 10 year old. I try to remind myself (and others) of this. As I say, my kids are intense, but I try hard not to let myself (or others) tell them that they need to be choosing their career goals now. The older is turning 9, and you’d imagine this wouldn’t be an issue, but it is. BJ, my daughter is 9, and the other day she said, rather sadly, that she isn’t sure what she wants to do when she grows up, and she feels like she should know. I was a bit surprised. (She used to say she wanted to be an engineer.) I told her to aim to be well-rounded for now, and when she finds her passion she’ll be ready for it. I also told her that plenty of grownups take a somewhat random job and end up loving it. Or not. But that’s OK. I agree that not everyone should go to college, but I also agree with those saying that it isn’t entirely clear who those people are until they try. In some cases, sure, it is fairly clear that someone should at least work a while and get mature, but who gets to decide for them? The people I know who worked before college — working as a traveling musician, or working at UPS for a year — made much better decisions when they finally got to school. A little exposure to the “real” world gave them much more data. One of the odd benefits of my in-laws’ LDS lifestyle is that many of the kids go on a mission at 19. They come back two years later, having traveled (often internationally) and essentially worked in a sales capacity. When these kids arrive on a college campus as freshmen at 21, they are infinitely better prepared to take advantage of the experience. Social rewards, including marriage; they call Harvard the #1 matchmaking service in the world. You tend to meet not “rich” spouses per se, but spouses who contribute in everyway to a marriage and children from that marriage. In addition, you meet friends from whom you tend to derive vast arrays of benefits in-kind. 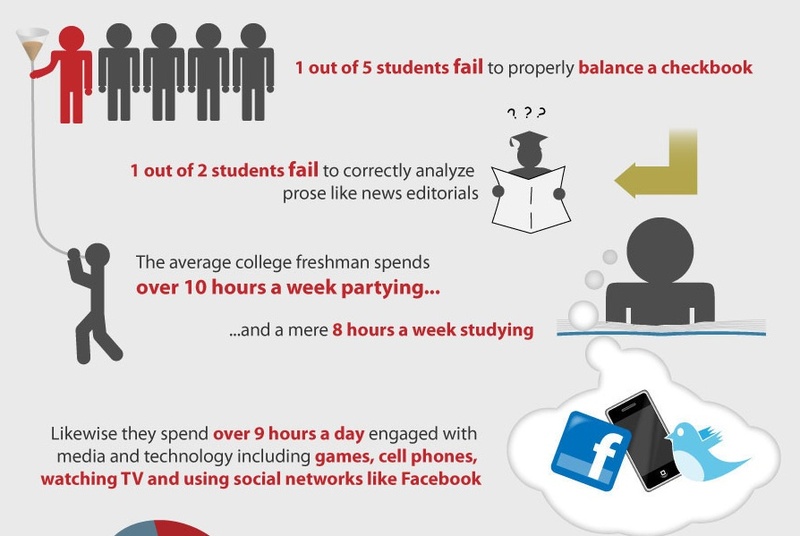 Go to college whatever this study says. It takes some kids, particularly boys, a lot of time to get off the ground. My richest close relative was the baby of the family, a goof-off in school and college (devoting his energies in college chiefly to late night card games and chapel evasion), but married pretty young, went through a professional program and qualified in a very responsible medical-oriented field, built a business and now owns big chunks of my home town. He is a ferocious Monopoly opponent. Another close male relative only fully realized his potential in his late 50s and early 60s, and is now running a successful micro-publishing house, something I wouldn’t have even dreamed of him doing a decade earlier, and he’s doing it all with cash (thank you, Dave Ramsey!). A third relative (now in his 20s) was bright and a voracious reader but not much of a student in K-12(he had a terrible time remembering to turn in assignments). The Marine Corps Reserves put him through college, as well as sending him for two tours in Iraq. He’s graduated from college now and has gotten through officer’s training and has a pretty good shot at getting to fly. Somewhere along the way from elementary school to college graduation, he turned into a very responsible young man, someone that you could literally trust your life to. I don’t know what causes men to get in control of their lives, whether it’s just time or the help of rites of passage like church missions or the military, but it’s a beautiful thing. I thought it was women. For relatives #1 and #3, I’m sure that entered into it.